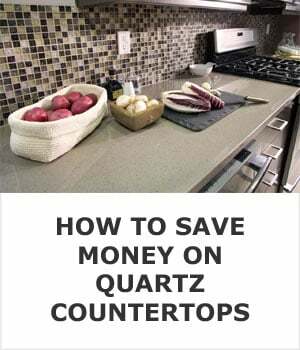 Hunting for the perfect quartz countertop? There are a lot of brands to choose from, but sometimes that blessing can also be a curse. 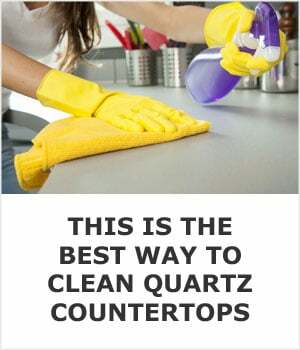 Some brands manufacture top quality countertops, but there are even more that cut every corner they can to squeeze every last dime of profit out of you. If you don’t buy a top quality brand there’s a good chance that you’re not going to be happy with them by this time next year. We put this guide together for you to recommend a few of the better brands. 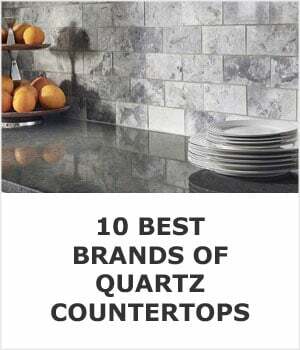 You can’t go wrong with any of these, and they each have a reputation for quality engineered stone and fair customer service. We intentionally aren’t numbering this list since all of these brands have good reviews, offer their own pros, cons, and unique styles. 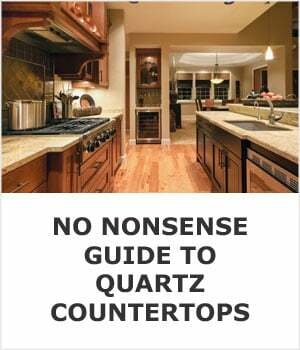 Having said that, there are plenty of manufacturers who could arguably be named the best brand of quartz countertops. So instead of trying to choose one I’d rather give you a list of good options. Silestone, Cambria, and Caesarstone are three of the most popular brands of quartz, so let’s take a closer look at them. The others on the list are good too, so if your fabricator prefers to work with one of them I would take their advice. Typically they know what’s best since they work with the product every day. Cambria is a privately-owned business, as opposed to a publically owned company that has stockholders to worry about. That, in and of itself, doesn’t necessarily make them the best - but it does mean that they can run things a little bit differently, having more control than a publicly-traded company who is beholden to earning as much revenue as possible for their shareholders. It show in their reviews too because you won’t find much negative press about them. Cambria is well-established in North America, and in the United States of America in particular. They have multiple locations in Minnesota, and they’re also in North Carolina, Wisconsin, Illinois, Indiana, and they’ve even got a location in Canada too. They are also sold at Costco, and since they are usually so competitively priced, it may be worth your time to get a quote from there. Cambria offers a full lifetime warranty, they stand behind their products in a serious way. Their designs are downright beautiful, and in some cases it’s hard to describe some of them as anything other than art. 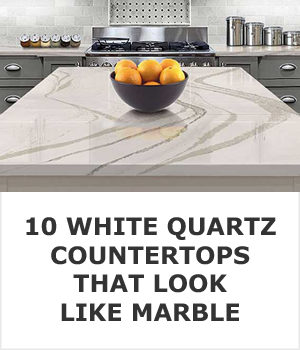 In particular the Golden Dragon, Marwell, and Huntley lines look like they could be paintings hanging on a wall in a gallery, but instead they’re quartz countertops that’ll look every bit as tasteful on a counter. Silestone, made by Consentino, likes to call themselves call themselves the original quartz. In 1990, they set out to create a new product that would improve on the benefits of granite countertops; what they ended up with is the brand we know as Silestone. Silestone comes with a 25 year warranty, which can be transferred, which is a nice perk to a potential buyer if you put your home up for sale. Silestone is made by combining natural quartz along with other raw materials to improve durability and performance. It’s also used for walls, flooring, and in bathrooms. It’s a versatile material that gets great reviews from lot’s of homeowners. There are a heck of a lot of tones, styles and colors that you can choose from to help you get the exact look that you’re envisioning. 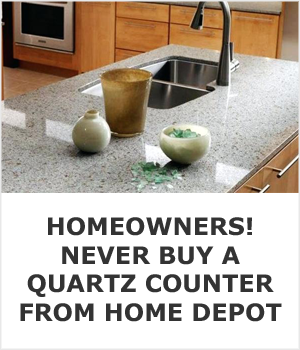 Caesarstone was one of the first companies to make quartz countertops. They’ve been a leader in their field for a long time, offering a ton of different designs and styles, and working closely with a number of skilled designers. 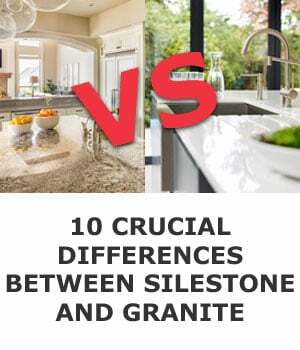 Caesarstone has an excellent comprehensive warranty and they are enthusiastic about taking care of their customers, although we have found a lot of fabricators that don’t agree with that statement. If your fabricator does not like working with Caesarstone I would take their advice and see what they have to offer instead. Rather than listing specific brands that aren’t great, we find it’s more useful to tell you some traits to look for. Brands come and go, but this advice will be timeless. Avoid buying any slab that you can’t see in person before buying regardless of how many good reviews you have read about them. When you order from big box stores you aren’t able to see the exact surface you’ll be getting. 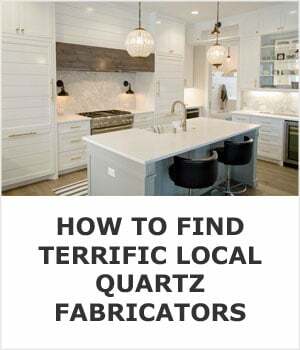 It’s highly recommended to head to the local stone yard or to a local fabricator to see and touch full slabs of quartz in person. It’s also a good idea to avoid brands that aren’t made in the United States. 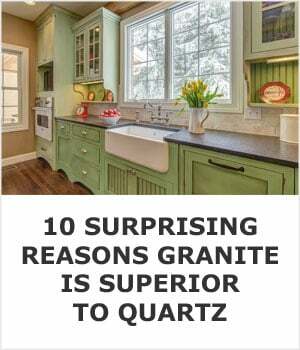 In particular, there is a lot of cheap quartz that is manufactured in China. The problems with the quality of the stone coming from China is well documented. I’m sure there are some good companies making quartz slabs in China but unfortunately they are the exception to the rule. Upgrades like a farmhouse sink or this slightly thicker counter will make your countertop the star of the kitchen. If there’s one surface in your home where quality matters and where you’ll notice the difference every single day, it’s your countertop. Don’t buy the cheapest slab you can from a “no-name” brand. The best way to guarantee that you’ll be happy with the countertop you choose is to buy a well known brand and to see the slab in person before you buy it.